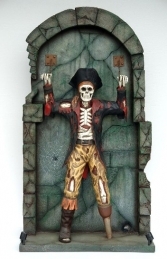 Our 3D 'Skeleton Pirate Sat on Treasure Chest' model looks just fantastic, imagine this in your Caribbean Pirate theme scene with our Captain Jack figure and the other Skeleton Pirate figures in our Pirate series. 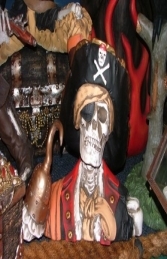 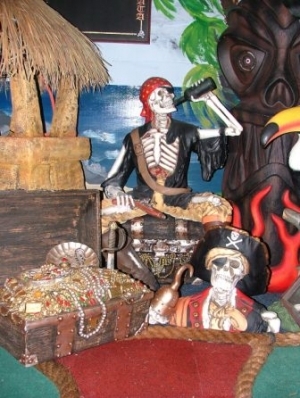 This wonderful seated replica Skeleton Pirate model, straight from Davey Jones locker, comes complete with the chest and a bottle of rum (we can also supply a treasure chest on its own with a removable lid which shows all the treasure inside JR2471). 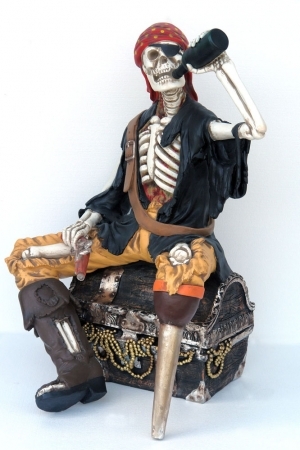 This Pirate Skeleton model is sure to amaze (or scare) all your visitors. 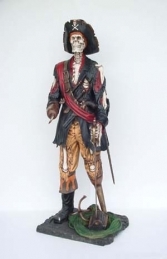 This fantastic life-size figure is ideal for themed areas, advertising or drawing attention to your business. It can be used in any themed area or in shops, businesses, pubs, restaurants, coffee shops, adventure golf courses, zoos, theme parks or even in your own home.